Scene of the Blog Featuring Cindy of Cindy's Love of Books! This week's guest on Scene of the Blog is another book blogger that I seem to have known forever. You know... you just can't remember where you met the person. What I can remember is that I like Cindy, and I like her blog. Cindy's Love of Books is a bright and cheerful blog that's a good mix of the occasional meme, authors' book tours, and Cindy's in-depth review of the books she's read. That's not all she talks about on her blog, but if you want to know more, you're just going to have to visit. Please don't forget to say hello while you're there! One more thing before I turn this show over to Cindy: if you'd like to see any of the photos full size, all you have to do is click on them. Take it away, Cindy! Here is where I do a lot of my reading. It's right in front my back window where I can look out onto my deck. As you can see in the picture there is my very comfy and warm (very soft) blanket. On the side I usually have my Kobo and a book or two of my current reads. Not sure if you can see it or not, but the case in the corner is full of Precious Moments. My husband started me on that collection about 12 years ago and over the years I built up the collection until I stopped about 6 years ago. I love to read here. My other reading spot would be my bed. This picture shows where I do all my blogging. 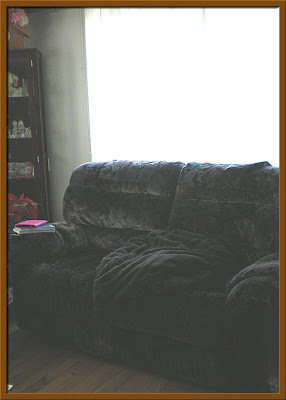 Thankfully due to the Christmas holiday, I had to clean up my blogging area because I blog in the family room. On top of the desk are photos and a candle. (I love to burn a candle when I blog or read.) On my desk the stack of books is books I have to review for the blog. Also on the desk I have my agenda in which I keep track of books, commitments, etc., along with a notebook for books I have read, another notebook for e-books and the last notebook is for my wish list of books. They are stacked behind my pen/pencil holder. I love my desk because my husband made this when he was in high school. Not sure if you can make out the mug but its from my favorite soap opera Coronation Street. I started watching this when I was pregnant with Michael and was instantly hooked. Now under the desk is a whole other story. As you can see, there is a ton of paper (Michael uses a lot of paper), a small bin of bookmarks (ones I love, made, or were given to me), in the bins there are tons of pens, highlighters, tape, post-its, cables for the digital cameras and my kobo and other essential blogging needs. Then on the right side you will see my printer and more papers. On the left side which isn't in the picture is Michael's bookcase filled with a ton of picture books both in French and English. Cindy, you're not the only one who's hooked on Coronation Street-- my husband is, too. I've lost track of the number of times he's said, "I've got half an episode of Corrie to watch, and then I'll be right down!" It is wonderful that you have a desk that your husband built! It is pretty and certainly looks very sturdy. I also like looking at the photos on the top of your desk. It's very easy to see how important Family is to you. And your reading spot? It looks so comfortable that I know I'd nap there much more than I would read! Thank you so much for allowing us this glimpse into your home and your creative spaces. We really appreciate it! Stop by next Wednesday to see the creative spaces of another member of the book blogging community! I feel like I've known Cindy forever too. 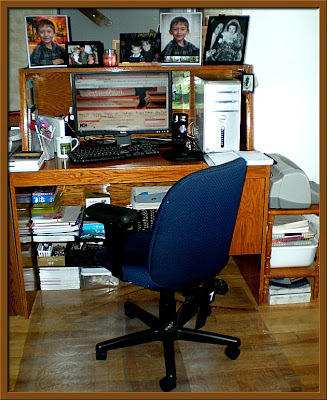 That is so cool that her husband made that desk when he was in high school! I'm curious about who's in the old wedding photo on the top of her desk. I love your space! You have a cozy site for reading and a beautiful desk for blogging. Lucky you! Thanks so very much Cathy for inviting me to take part in Scene of the blog. This is my absolute favorite feature of your blog. I was trying to figure out how I came across your blog and I just can't see to remember. You are an awesome person and I love coming to your blog. Thanks for the comments Kathy & Beth. To answer your question Kathy the wedding picture is of my late (favorite) aunt and uncle. My husband built my desk too and I will never part with it. I love your reading spot as well. I like to curl up in my recliner with a quilt by the window. I love reading by the window in my living room as well. There's something about natural light, when you can get it, that is just so nice! So very cool that your desk is something your hubby made in H.S. And that reading space looks soooo comfy! Cathy I meant to add earlier that yea another Corrie Fan. How did he get into it? There is alot of Canadian Corrie Fans here. Oops thanks everyone for the comments. Looking forward to discovering some new blogs. I've read Cindy's blog for quite some time, certainly since early last year. Haven't commented in a while though. I need to do better about that, Cindy. Your couch looks comfy or nap worthy and I love your desk set up. Thanks for sharing with us! Kay don't feel bad because I haven't commented much either. I have to work on that. Your reading and blogging spots are great, Cindy! Cathy, this is the first time I've visited your blog (it's wonderful), and I think this is a great feature. Also, I can attest that Cindy is the sweetest person and a great choice for this meme! Cindy-- My husband is English, so Corrie's something that he's practically grown up with. Donna-- I'm so glad you stopped by and that you like Scene of the Blog! Cathy I didn't know that. I think because Canada has tight ties with England (we love the royal family) and thats why so many Canadians love the show. Granted we are like 6 months behind in airing it here. None the less I still love it. Thanks again for allowing me to be a part of this. I love this feature Cathy! What a great way to get to know other bloggers! Cindy, everything looks so cozy! I love your desk and would treasure it always. What a talented husband you have! Michael is very handsome in his photos and I could curl up on that couch myself. You have such a nice place to write your terrific blog! A big thank you to Cindy and everyone who stopped by!